This simple asiago bread is ready in just a few hours! 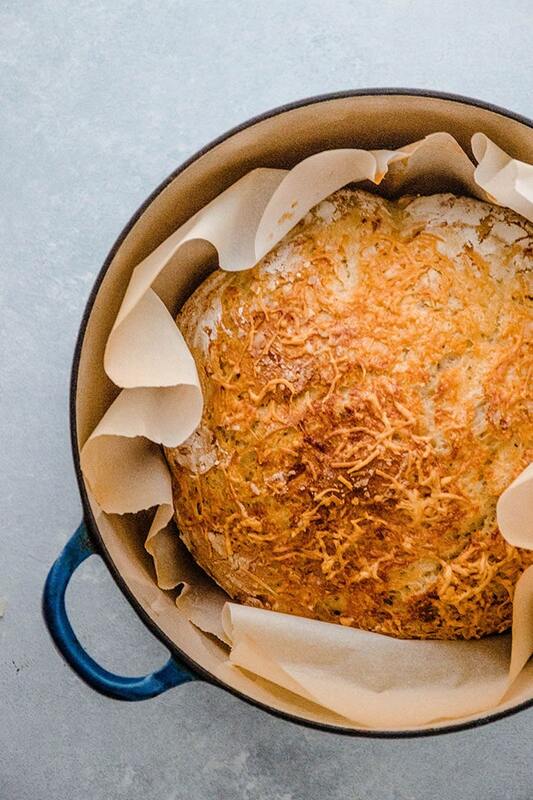 Easy asiago cheese bread baked in a Dutch Oven for a crispy crust and chewy interior. STEP ASIDE, plain ol’ easy crusty bread. There’s a new game in town. And it’s covered in asiago cheese. (but also jk easy crusty bread you know I can’t live without you). (but ALSO also, this asiago cheese bread is REALLY, REALLY GOOD). 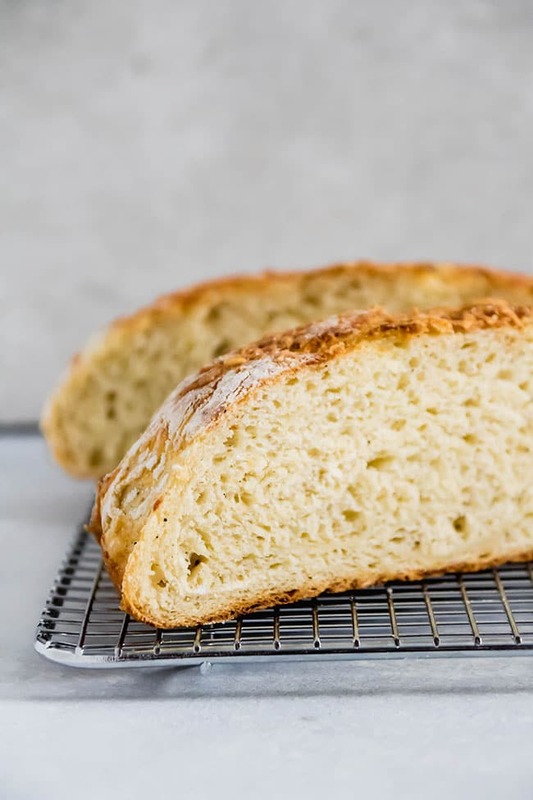 I’ve been testing variations on my classic weeknight bread for a few months now, and this asiago bread recipe almost IMMEDIATELY shot up to the top of the “favorites” list. If you’ve made my Dutch Oven bread before, you’ll recognize the technique, but we’re playing up the flavor here by adding a dash of fresh ground pepper and a boatload (<— actual measurement. sort of) of asiago cheese. Mix the dough – 15 mins. Shape the loaf – 5 mins. Rise again – 30 mins. 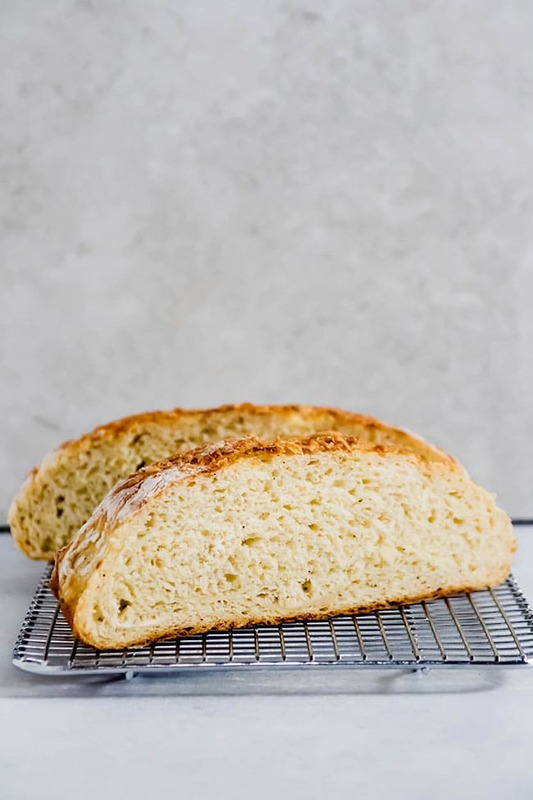 This asiago bread is pretty forgiving, so don’t be afraid to mix it up and try some other flavors! I love adding herbs, roasted garlic, olives, or sun-dried tomatoes to the mix. And while I love using my Dutch Oven for this (hip hooray for a nice crispy crust!) you could also totally shape this bread into baguettes or bread bowls. (Side note: an asiago bread bowl? YES, PLEASE). 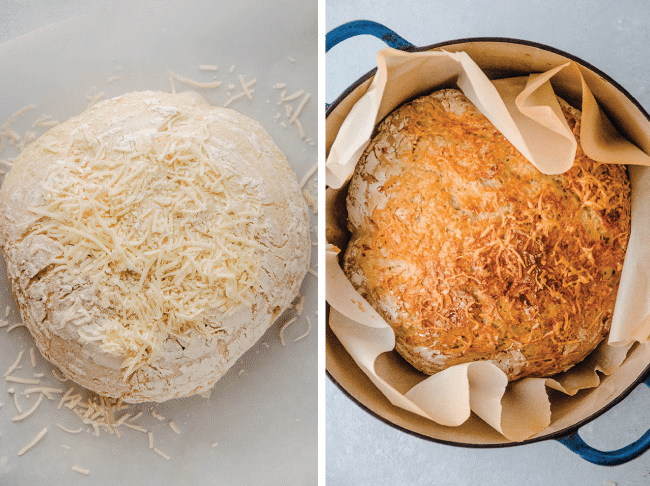 This simple asiago cheese bread is ready in just a few hours! 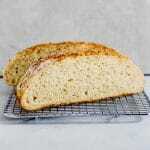 No-knead asiago bread loaf baked in a Dutch Oven for a crispy crust and chewy interior. Combine yeast, sugar, and warm water in a large mixing bowl. Add 3/4 cup of the asiago cheese to the bowl – save the extra 1/4 cup of cheese for topping the bread later! Add flour to bowl a bit at a time and stir gently with your hand or a sturdy spatula until all flour is incorporated and dough has come together and pulled away from the sides of the bowl. The dough won’t be completely smooth and may even look slightly shaggy – that’s ok! When dough has doubled in size, lightly flour a large cutting board. Tip the dough out of the bowl and onto the cutting board. DON’T PUNCH THE DOUGH DOWN – you want to keep all those nice air bubbles intact so you have an airy, delicious loaf of bread. (Tip: If the dough is sticking to the bowl a little bit, just wet your hand with a bit of water and gently separate the dough from the bowl to get it all out). Flour a proofing basket or a small mixing bowl and place your loaf into it seam-side down. Cover with a tea towel and let rise another 30 minutes or so, until not quite doubled in size. 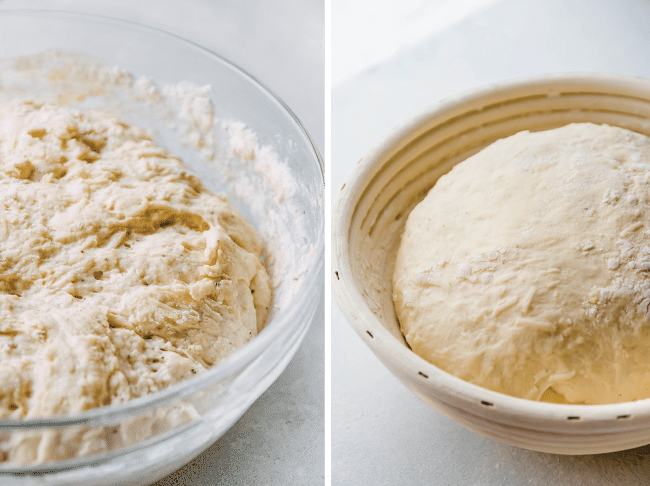 While bread does its final rise, place an empty dutch oven (with the lid on) in your oven and heat to 460 degrees F.
Tip your bread dough gently out of the proofing basket back onto your floured cutting board. The seam side should face up this time – that’s what gives it a nice crackly look on top! If you’d like, you can tip the bread onto a piece of parchment paper to help you lift it in and out of the pot easily. Sprinkle the remaining 1/4 cup of asiago cheese over the top of the bread. VERY CAREFULLY (without burning yourself!) lift the bread loaf and place it – seam side UP, this time – into the hot dutch oven. Put your oven mitts back on, put the dutch oven lid back on the pot, and slide the whole thing back into the centermost rack of your hot oven. After 30 minutes, remove the lid from your dutch oven. The bread should be crusty and very lightly browned. Continue cooking the bread, uncovered, for 10-20 minutes more until the bread has deepened in color and you have a beautiful brown crust. Use a long spatula to lift the bread out of the dutch oven and onto a cooling rack. Let cool for at least 20 minutes before cutting into it. Slice, slather with butter, and enjoy! I have two Le Creuset Dutch Ovens (from two different decades) each with the plastic knob, and I have not personally had a problem at this 460 degree F temperature (although some people have reported their plastic knobs melting at high temperatures). If you’re worried about the knob on your Le Creuset melting, you can replace it with one of their metal ones for relatively cheap! As always, please check the care instructions on your equipment and use your own best judgment. You may not need all of the flour here, or you may need a little more. This is a fairly slack (wet) bread dough, and you may also need to adjust the amount of flour based on your measuring technique, the humidity in your kitchen, or a variety of other factors. Trust your instincts and don’t be afraid to adjust as you go! You can use pretty much any size of Dutch oven (or French oven, as Le Creuset calls them) for this bread – anything in the neighborhood of a 5- or 6-quart size will work. 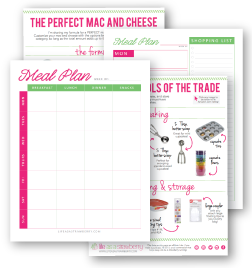 If your kitchen is cold, you may need to extend the rising/proofing time by a few minutes. This dough isn’t as smooth as you might be used to with my Easy Crusty French Bread because of the cheese mixed in, so don’t worry if it feels a tiny bit different! Use honey in place of sugar if you prefer. Adjust the amount of asiago cheese or black pepper depending on your preferences! This is a pretty forgiving bread recipe and tastes great with other mix-in additions as well: sun-dried tomatoes, olives, rosemary, roasted garlic, chopped herbs, etc. 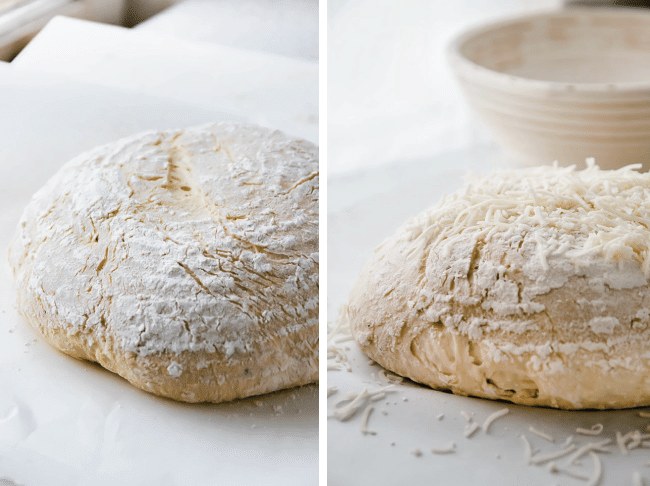 Mix this dough by hand or use a stand mixer – it tastes good either way! When do you add the pepper? Is there a reason you use flour instead of olive oil when rising for sticking? Made this yesterday and it was so easy and so good. Thanks so much for this! Hi Jen, it is quite tasty! I tried this bright in the Dutch oven it came out wunderful just like you said. I had tried this…and this is really tasty one..
i like this very much..